There are cars and there are legends. Some cars need to impress the customers with their performance and their looks. But these legends on the other hand thrive by their very existence. Being in the automobile scene for decades, these legends have redefined automobiles and continue to become the poster icons on major car scenarios. One such amazing icon is the Mini Cooper brand. The car saw decades of success where it traveled through continents housed regular folks as well as dignitaries. The car was renowned for its simple design and captivating visual beauty. The car is also known for being essentially arresting. The class depicted by this vehicle can never go unnoticed. With its amazing beauty and appropriate curves, the car succeeded in being a head turner over the years. Among the major success achieved by the iconic car, the most impressive thing remains consistency. Though the Mini Cooper was constantly engineered to meet contemporary technical and design excellence, it never crossed its traditional design becoming one of the most desired vehicles. The latest models of the Mini Cooper too offer an impeccable resemblance to the original model, which is hard not to notice. Among the elite range offered by this luxury car maker, the Mini Cooper Countryman D is the one of the two diesel variants available in India. The Mini Cooper brand is also known to make the best out of the resources it has. Though the Mini Cooper never comes with ground breaking engines like the one Ferrari or Audi amuses us with, it manages to make the most of the simple engines it has. This is evident in the amazing top speed of 180 Kmph in the Mini Cooper Countryman D with a humble 1.6-litre engine. The vehicle also manages to speed up till 100 Kmph in mere 11.3 seconds. However the successive accessories of the Mini Cooper provided by the company, make the vehicle most impressive. Mini created a whole universe around itself where each and everything about the car is a symbol of beauty, elegance and excellence. Though the price might seem unreasonable for an average customer, a true automobile enthusiast would definitely jump in glee at the very thought of owning such piece of history. The exteriors are magnificent in the Mini Cooper Countryman D and clearly offer a magnanimous history in its design. The entire body is made to resemble everything that Mini is all about. This car does not offer anything exceptional in its exteriors and it certainly does not offer anything less. It just gives what is needed and in the amounts it is needed. The front fascia of the vehicle reflects pleasant elegance with the large headlamps, front grille and fog lamps. The vehicle does have chrome lining along the borders of headlamps and radiator grille giving a visual beauty to the vehicle. The side skirts are offered along the design from the front wheel arches to the side profile. The rear headlamps are positioned on the rear shoulders to offer perfect amount of lighting when riding. The exteriors house decent roof that slightly decreases in height as the design progresses to the rear. The Mini Cooper Countryman D comes with adjustable headlights, fog lights in the front and rear, power adjustable exterior rear view mirror, rain sensing wipers, rear window defogger, alloy wheels, power antenna, tinted glass, rear spoiler, sun roof and an optional roof carrier . All these essentially make the Mini Cooper Countryman D an owners delight. The interiors of the Mini Cooper Countryman D explains everything that the brand is all about, excellence, elegance and efficiency. The car’s interiors offer a futuristic look at the automobiles, while the exteriors depict legendary tradition. The interiors house a beautifully rendered display in the middle of the dash. It has vents on either side of it to offer visual symmetry. The steering wheel comes with the iconic Mini design. The interiors also house a best in class seating arrangement that transcends in taking the traveling experience to a whole new level. In terms of features, the interiors feature air conditioner, heater, adjustable steering column, tachometer, leather seats, leather steering wheel, glove compartment and basic entertainment amenities. 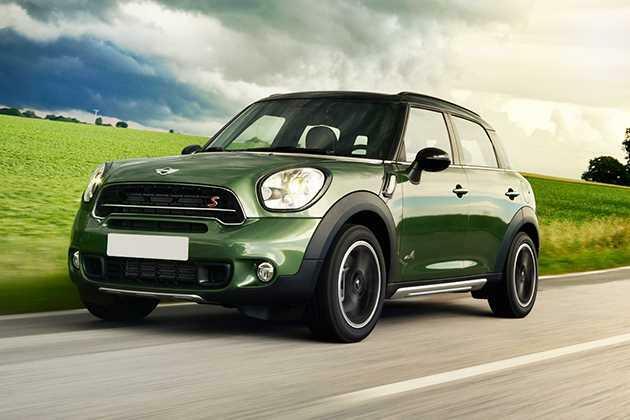 Impressively the Mini Cooper Countryman D comes with diesel engine, which makes it remarkably fuel efficient. Powered with a 1.6-litre diesel engine , the vehicle has sixteen valves as a whole and the displacement offered in 1598cc. The vehicle is capable of churning out a maximum output of 112bhp at 4000rpm , while the torque reaches a decent 270Nm at 1750rpm. The direct injection fuel supply system in the car also ensures a smooth journey. The engine is capable of allowing the vehicle to travel to a top speed of 180 Kmph, while the pickup is also exceptional at 11.2 seconds to hit 100 Kmph speed mark. The vehicle also has a decent mileage of 12.3 Kmpl in city and 16.6 Kmpl on highways. The Mini Cooper Countryman D comes with disc brakes in the front and drum brakes in the rear section, the ABS system comes handy in offering an efficient braking system. The Mini Cooper Countryman D comes with power steering, front and rear power windows, height adjustable front seat belts, remote trunk opener, low fuel warning light, engine start stop button, parking sensors, foldable rear seat, smart access card entry, engine start stop button, CD and DVD player, speaker system and radio. The vehicle is armored with anti lock braking system, brake assist, central locking, power door locks, child safety locks, anti theft alarm, driver and passenger airbags , side airbags in the front, day and night rear view mirror, rear seat belts, traction control, engine immobilizer, crash sensor and keyless entry. Pros: Captivating design, powerful engine. Cons: Expensive to own and maintain.